While familiar in form to most of us, orchid flowers retain a sense of the profoundly exotic, especially those blooms of the Paphiopedilum variety. These distinctive orchids have been collected from their forest floor and canopy habitats of Southeast Asia, and are now widely cultivated and hybridized. I have never managed to keep a Paphiopedilum maudiae orchid happy among my small houseplant and orchid collections, but I have been lucky to see many of these dramatic flowers at orchid shows and greenhouses. This pair of fuzzy pink and chartruese lady slipper orchids are some of my favourites, with both stripes and spots in varying shades and petals bristling with tiny hairs; striking and delicate all at once. 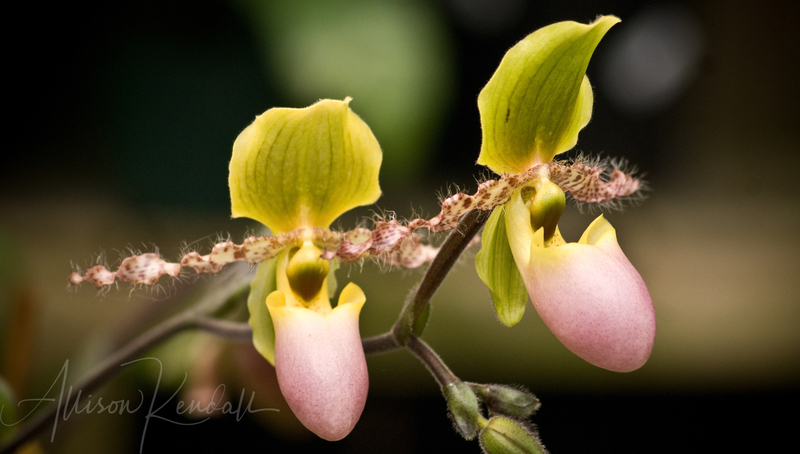 I have collected many photos of orchid flowers over the years, and have gathered the most stunning specimens into a gallery of Orchidaceae images available as fine art prints. I have not had a chance to identify most the the specific orchid varieties, and if you are an orchid aficionado who is good at plant identification, I have a print-discount code for you in exchange for a few good taxa tips – leave a comment on this post if you’re interested!